Minister of Environment and Energy, Thoriq Ibrahim has stated that by the end of President Abdulla Yameen Abdul Gayoom's first term in office, sewerage systems would be completed in 49 islands while water networks will be completed 23 islands. 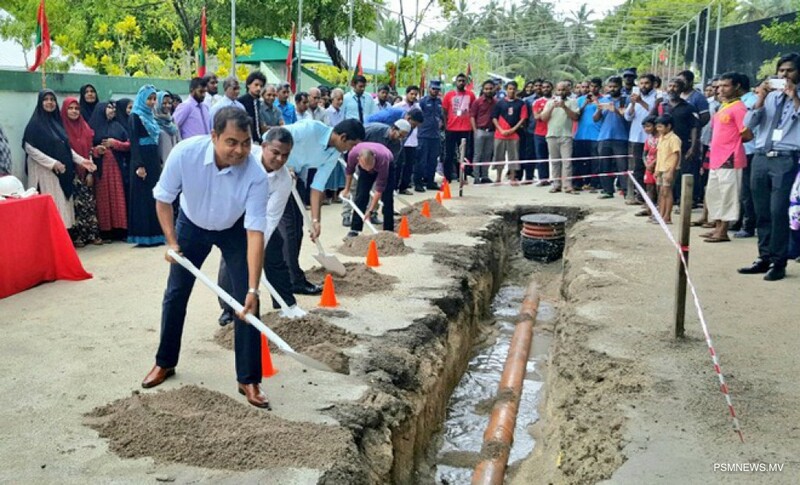 It is a target of the government to ensure water and sewerage systems are established in 75 percent of the islands by the end of the first term of President Abdulla Yameen Abdul Gayoom. As part of the effort to reach this target, the government has been conducting various projects to establish water and sewerage networks in the islands. In the past three years, government has already established water networks in 17 islands and sewerage systems in 18 islands. The government has also begun development of water networks in 26 islands and sewerage systems in 47 island islands this year. Efforts are also underway by the government to ensure safe drinking water in all islands, according to Minister of Environment and Energy, Thoriq Ibrahim. The Minister noted that the ministry have been receiving immense support from government institutions to provide water and sewerage services to 75 percent of the country. Government aspires to build proper water and sewerage services in all inhabitant islands, ensuring it is developed cost effectively, using latest technology and that it meets environment friendly standards. The Ministry said it hopes to involve both public and private sector in such projects, to ensure all residents are given participation in the effort to build a resilient and more sustainable community.